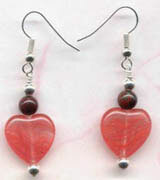 I will show you how to make beaded earrings. This is a great project for beginning jewelry makers! For the earrings pictured here I choose hearts for my main bead. You can use any shape for your design. Tear drops look really nice as well as stars or big round beads. You really have a choice with your beads. There are a variety of different shapes and sizes. Your dangle earrings consist of a headpin with beads placed on it to make a combination of colors and shapes. It should not be too heavy for comfort. 1. Arrange some beads on the head pin. Experiment with different colors and styles. Use spacer beads to break up the colored beads. 2. When you like the design, take the wire cutter and snip off the excess headpin, but leave about a half-inch above the top bead. 3. Now take your pliers in your dominant hand, and hold the headpin and beads in your other hand while pushing down lightly on the top bead so it's out of the way. 4. Grasp the end of the headpin wire tightly with the pliers. Twist your wrist slowly in a circular motion until the end of the headpin forms a small loop. You want to turn a small loop that closes securely so the ear wire won't slip out. 5. Don't worry if your loop is not completely round. It doesn't have to be. When you wear the earring, this loop will be almost invisible. 6. With your pliers in your hand and the ear wire in the other hand, open the loop on the ear wire by moving the pliers in one direction and your other hand in the opposite direction. Open the loop just enough to fit the headpin wire on it. Never pry or pull a loop open -- it is almost impossible to close it properly. 7. Hang the headpin loop on the open ear wire loop. 8. Close the ear wire loop by squeezing it with the pliers to return the loop back to dead center, closing the circle. Test your work to make sure the headpin won't come off the ear wire. That's it! Make another one, and you have your pair!